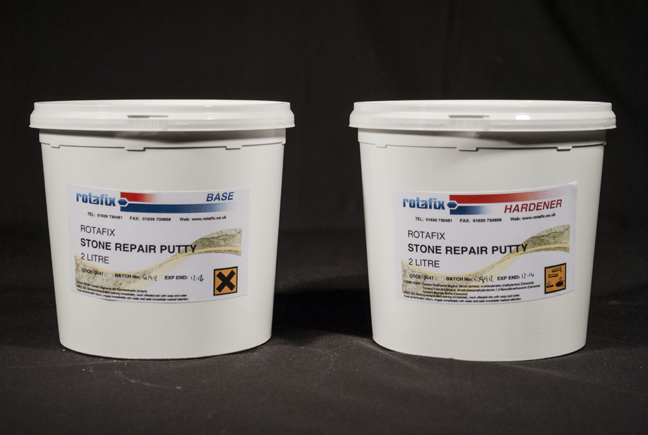 Rotafix Stone Repair Putty is a 2-part epoxy system. When combined the repair putty is a malleable compound that can be hand or trowel applied to masonry and then roughly shaped to the contours of the substrate. Once cured the putty can be machined, sanded or chiseled into a finished profile. The cured material is shrink resistant and will not crack or move as a result of fluctuations in temperature. If necessary the material can be removed by applying heat from a paint stripping gun. This gives a reversible option which some restoration projects require. Stone Repair Putty can be coloured to match the substrate assisting you in creating the visual appearance that the repair is not present.